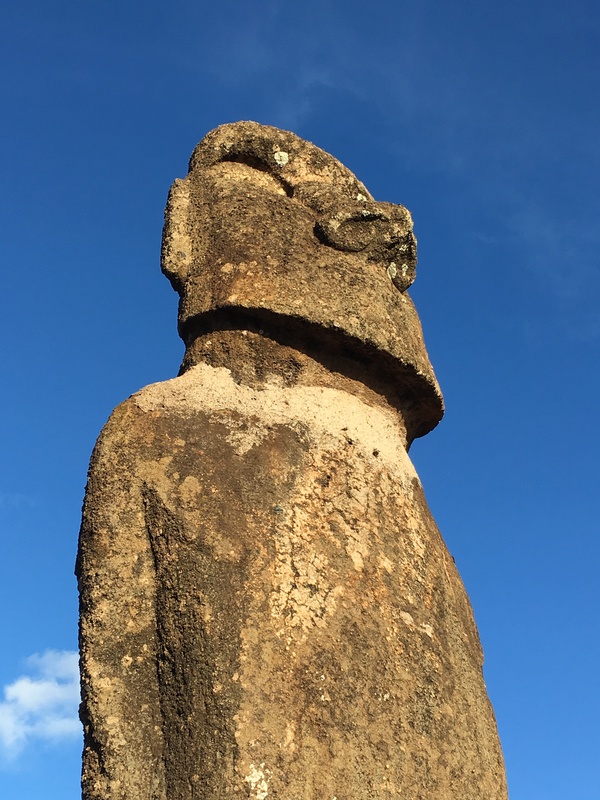 Easter Island, (Isla de Pascua to Chileans and Rapa Nui to the Polynesian natives) lies roughly halfway between mainland Chile, 3,700km to the east, and Tahiti, 4,000km to the west. There are currently only three viable options for getting there: catching a five-hour flight from Santiago, the capital of Chile, or one of the weekly flights from Tahiti, both of which are operated by LATAM Airlines. The other option is to book yourself on one of the cruises that include the island as part of its itinerary, however routes are seasonal and at the mercy of tide and weather. I’d always imagined the island to be the domain of more intrepid travellers. But as I watched the latest Hollywood blockbuster on the brand-new Boeing 787 flying me to the main town, Hanga Roa, it felt anything but off-the-beaten track. Landing on the only runway on the island at Mataveri Airport proved to be a surprise as well. Set against the backdrop of lush hills and with the sparkling waters of the Pacific only meters from both ends, the runway was wide and long and could’ve served any of the larger airports around the world. I later learnt it was created as a landing strip for NASA space shuttles. The airport terminal, however, was what I’d expected of a remote island – a tiny, single-storey building with a traditional Polynesian thatched-roof and fairly limited facilities. It is said that 90 percent of the island’s population live in Hanga Roa, but it is hardly cosmopolitan. The sole town on the island comprises of two main streets lined with souvenir shops, tour companies and a handful of overpriced cafes. There is little doubt that it has been set up to cater to tourists. However, we did manage to get a glimpse of island life. We’d rented a private cabin for our stay on the island. At the airport we were greeted by the owner and his daughter, who proceeded to place a lei (Polynesian garland) around my neck. They drove us to the property – a 15 minute drive through the centre of town and then up a muddy dirt track lined with banana trees. We were welcomed into our two bedroom cabin, built right in their backyard, by the owner’s vivacious wife, who showered us with kisses and Spanish endearments, and by their dogs, who drowned out all conversation with their cacophonous barking. As the afternoon sun dipped low, providing welcome respite from the tropical heat, we prepared to head out to explore the town. At the same time, family and neighbours dropped in on the owner’s. They sat around bright plastic tables, under the shade of wide, verdant trees, talking and sipping on ice cold drinks. I was enthusiastically introduced and at the mention of “Bangladesh” was welcomed by a torrent of excited Spanish. Walking past other peoples’ properties, we noted similar scenes. It appeared that the heart of the community lay in these backyard tete-a-tetes, akin to the addas back home in Dhaka. 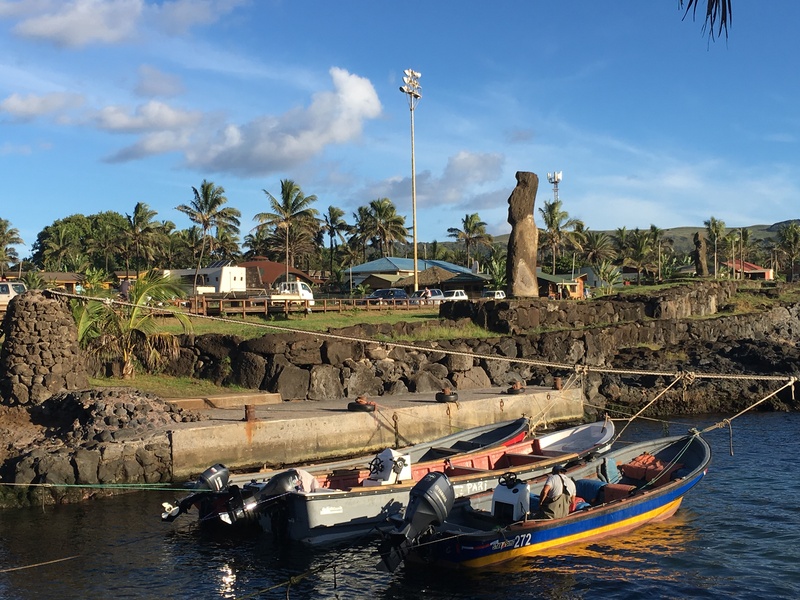 The island’s remote location which adds to the exotic appeal of Easter Island also has another rather unfortunate consequence. Grocery staples that we take for granted at supermarkets in large cities around the world are in limited supply and come with incredible price tags – only fair as these products are subject to a sea voyage of fantastic proportions. Our culinary skills were put to the test as we quickly learnt to improvise and source food from locals who sold fish, meat and veggies from the backs of trucks parked on the main avenue. We also discovered the island’s favourite snack – tuna empanada, which we tucked into with gusto while sat around a small square trying to access the only public wifi spot. We managed to Facetime the grandparents. The connection was patchy, the conversation brief, but it felt surreal to be Facetiming loved ones from the most isolated island in the world. Locals were quick to assure us that we could walk to any place in town. Indeed the town is small enough, but sudden tropical showers, liberally rutted roads and muddy trails made for a healthy challenge, especially if when burdened with a toddler and stroller. Stray dogs too, seemed to delight in barking and chasing after untoward pedestrians, making our forays into town fairly adventurous. We walked past the striking Iglesia Hanga Roa, the town’s only Catholic church. 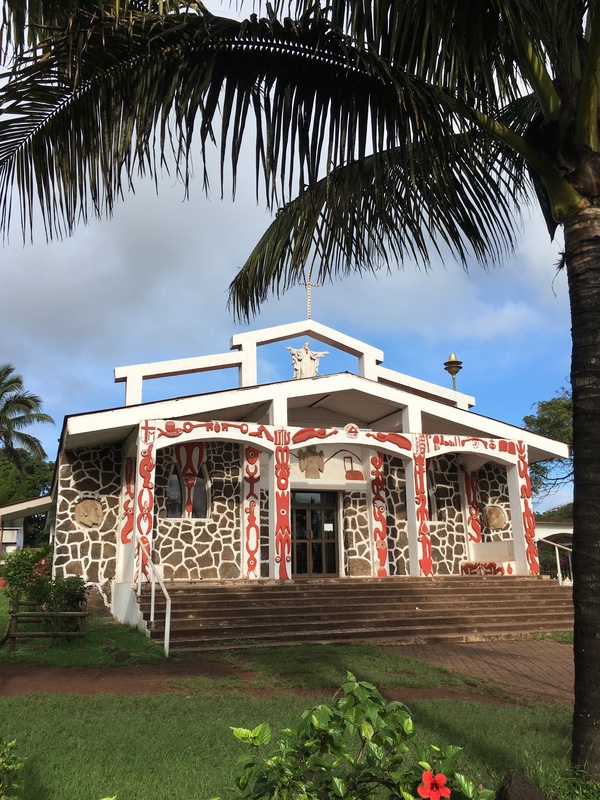 The sunlight cast a glow on the Rapa Nui carvings decorating the façade, an apt representation of religion and local art – a building like no other. As we approached the tiny but picturesque harbourfront, set amidst tourist cafes, tattoo parlours and waves crashing onto the black, volcanic rocks. 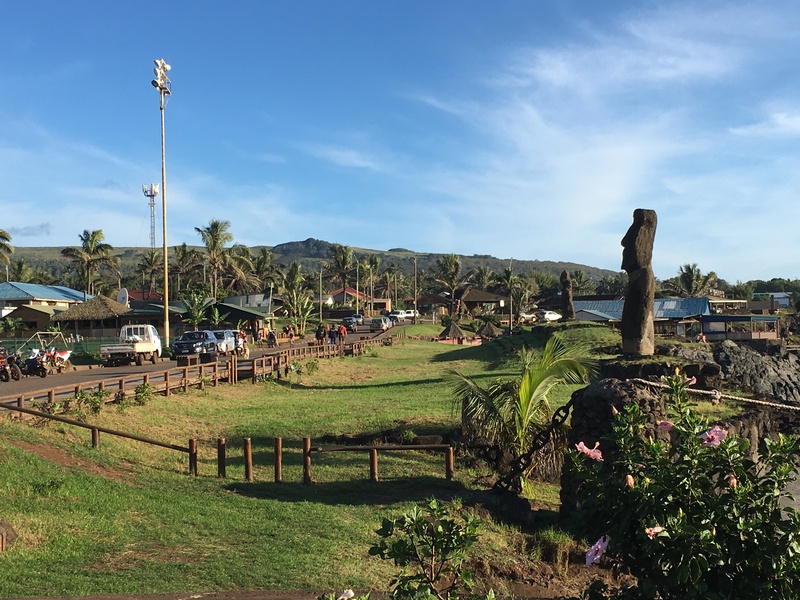 There, with its back to the harbour and looking over the town’s football pitch, stood a Moai, the Ahu Tautira (ahu is Rapa Nui for ceremonial platform). 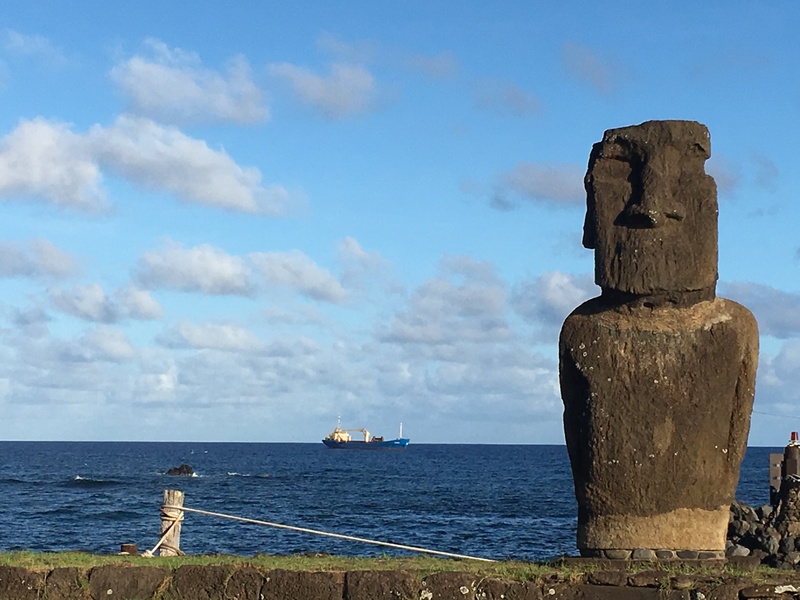 Perhaps it was because of all the mystery enshrouding the Moai, but I was shocked to find one within walking distance of my cabin, with cars zipping past and Ed Sheeran blaring from a tinny speaker in a nearby café. We’d saved visiting Ahu Tahai, an archaeological complex, for sunset. The site, within walking distance from the town centre, features five Moai statues of varying shapes and sizes on one side, and a large solitary statue off to another side. Framed against the Pacific Ocean, the setting sun cast an ethereal glow. It would’ve been one of the most sensational sunsets I’d have ever witnessed, had it not been for the stray dog that pounced on my toddler’s dinner, wolfing down not only his sandwich, but also the still packaged fruit bar I’d retrieved from my bag to offer my hungry child. Elbowing the dog out of the way, which in hindsight was possibly not the wisest thing to do, I picked up my bawling baby and together with my husband, we walked off… away from the sunset. Next stop: Rano Raraku, Easter Island!